"Raising Old Barns to Make a New Village"
Lumberland Post & Beam is developing properties in the Delaware River Valley between New York and Pennsylvania. LP&B focuses on the reconstruction of barns in idyllic community settings and the recycling of barn materials for new construction or renovation. Barns are efficient, spacious, highly adaptable, extremely durable, and are majestic in field or forest. Our approach preserves and restores these structures with all modern amenities and does so without compromising their original character. Materials reclaimed during our dismantles are restored and reused in all aspects of construction and provide a beautiful finish to any space. • The Times Herald-Record - April 28th, 2007. Sparsely populated and spectacular, the Delaware Valley is one of the most beautiful resources in the North East. Dramatic cliffs and narrow winding roads have discouraged conventional development and the area remains a refuge from urban sprawl. 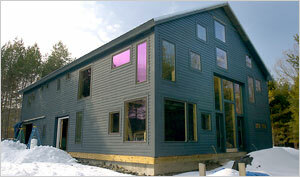 Our first project, on Bloom Road in Pond Eddy, New York is set in this ideal location. Less than 2 hours from New York City and minutes from the Delaware River, the properties feature dense woods, streams, and pond and all within a 50 acre forest preserve. LP&B has dismantled and stored many barns, barn frames and other historical structures for future use. Parts are tagged for identification and drafted on computer for design and reconstruction. Buildings may be used in future developments, or they can be constructed on land provided by the customer. Our modified timberframe and Polish log homes provide prospective homeowners with smaller and inexpensive alternatives to a full barn frame. Customers may hire LP&B for full construction or work with their own contractor. LP&B has an extensive collection of reclaimed materials that can be used in the construction or renovation of homes, offices, and apartments. These materials, which come in a wide variety of colors and sizes can be used for interior and exterior purposes. We take orders, deliver materials, and provide installations. Copyright © 2007 Lumberland Post&Beam. All rights reserved.